sing healing herbs is not just a Centuries Old Practice, rather it has become an important practice today as more and more people look for healthier options for their every day needs. For those of you just starting out using natural healing herbs, I understand how overwhelming this can be. For myself, I knew eating healthier foods was important but I was very surprised to find out that anything we put on our skin topically is absorbed through the skin into our blood stream and to our organs. Also, some substances like petroleum and synthetically engineered products are not absorbed so well by our skin and may cause damage to our bodies, like plaque in our blood vessels or lessening the effectiveness of natural herbs so they don’t perform at their maximum healing potential. Doesn’t it make more sense now why people are paying more attention to what they put on their skin topically? I realize this is a big step for many people and I would like to suggest that you start out slow and small. Choose one area of your body that has the most need of healing herbs. If you have sensitive skin, then try a face crème for sensitive skin. Is your skin dry or cracked? Then try a healing balm. The 1st product I made was for myself was a face cream for my sensitive skin, because my eyelids would swell and my face would breakout into a rash when I used over the counter face products, even the expensive ones! In my research, one of the things I learned about was the irritating effects of lanolin on sensitive skin, so I excluded it and came up with my Lavender Crème for Sensitive Skin. 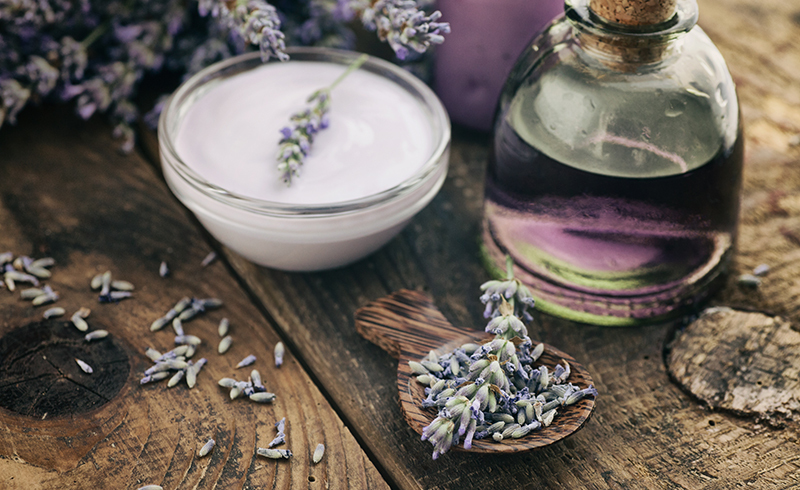 Lavender is so gentle and has great calming effects on sensitive skin.